As those charged with wild horse and burro protection begin drafting plans to sterilize our herds, their eyes turn once again towards the Nevada Wild Horse Range, aka Nellis, as the backdrop to continue their experiments aimed towards the wild horse and burro wipe outs. The Nevada Wild Horse Range was established in June 1962 in response to America’s over whelming love of wild horses. It was the first of its kind, created through a cooperative agreement between the BLM Nevada State Director and the Commander of Nellis Air Force Base and finally offered a place for wild horses to live in peace - free from brutal hunting, poisoning and slaughter. The Range originally spanned 435,00 acres but was reduced to 394,000 acres in June of 1965 and BLM inherited the Nevada Wild Horse Range in 1971 due to the passage of the Wild Free-Roaming Horse and Burro Act. Though wild burros were also recognized on the NWHR in 1974 with plans to manage for them, somehow their "federally protected status" was circumvented and in 1993 BLM removed the last 126 wild burros and now manages the Range “burro free”. In 1985, BLM established a Herd Management Plan for the NWHR that proposed an AML of 2,000 wild horses with 4,000 to 5,000 wild horses estimated as roaming throughout the Range(1) but in 1991, BLM approved a 50% reduction and formally established the AML of 1,000 wild horses. 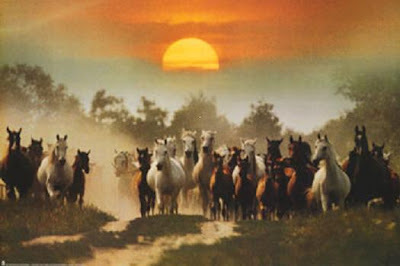 By 1993, the NWHR was home to the largest wild horse herd in America as populations peaked to nearly 10,000 strong. 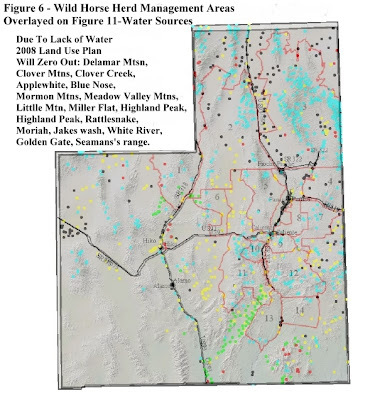 Due to the constant ongoing military operations, BLM had great difficulty accessing the NWHR and wild horse numbers swelled until reaching critical levels, which resulted in a crisis that caused many to die of dehydration and starvation. Because of the high populations of wild horses on the NWHR, BLM determined the herds would make excellent candidates for fertiliy control experiments, so in 1996 the NWHR mares became one of the first to receive the fertility control injections and it has been used on them ever since. The proper management of wild horses on a restricted military base has always been an issue for BLM as a lack of access has complicated trying to manage them due to the highly restrictive nature of the ongoing military operations. On January 29, 1997, BLM published a Wild Horse and Burro Evaluation for the NWHR with the evaluating team recommending BLM no longer be responsible for managing the wild horses or the Range. In 2004, BLM drew up new plans for the NWHR that approved some pretty radical changes including cutting the AML again by another 50% with a new AML of 300-500 wild horses as well as dramatically increasing the Herd Management Area to 1.3 million acres. 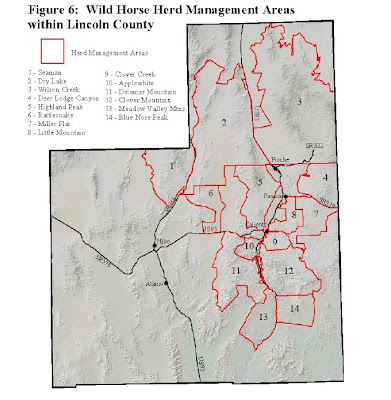 Despite this massive increase, BLM redrew the boundaries of where wild horses will now be allowed by declaring only one third of the Range as the “core management” area; any wild horses found outside this area will be considered “outside the HMA” and removed. 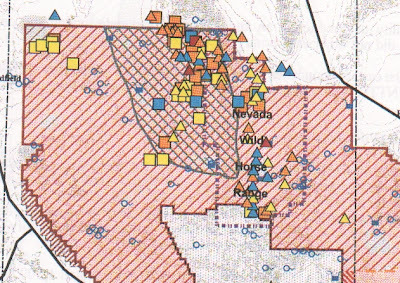 This includes the herds of Kawich Valley, one of the three most well known and documented herds on Nellis and BLM knew when they approved these plans they were approving the permanent wipe out the Kawich Valley herds. 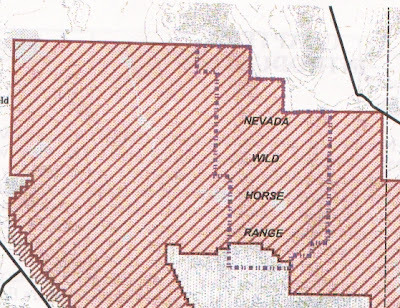 Here is a map of the Nevada Wild Horse Range in 1992. 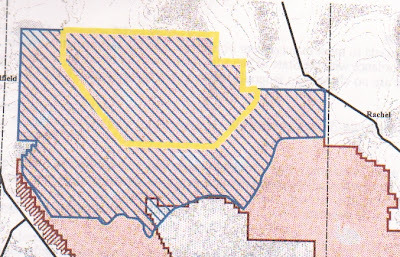 Here is a map of the new boundaries BLM approved in 2004. Here is a map of documented wild horses between 1972-1974. If all this wasn’t enough, now they want to castrate the stallions too? For more on the Nellis wild horses, click on these links to other American Herds stories. Update: BLM reported that the wild horse featured in the What Happens In Nellis, Stays in Nellis was a mistake and was merely mismarked as being captured at Nellis. For a copy of the BLM 1992 Wild Horse and Burro Evaluation, Click Here. Nellis Wild Horse Range – Preliminary Gather Plan, EA# NV-052-2007-362. (1) United States Department of the Interior, Bureau of Land Management, Las Vegas Field Office, Proposed Nevada Test & Training Range Resource Management Plan and Final Environmental Impact Statement, May 2003, pg. 3-46, as well as all maps used. As the National Wild Horse & Burro Advisory Board’s 2/25/08 meeting draws near, rumors have been flying that managing wild gelding herds is the hottest topic currently on the table. 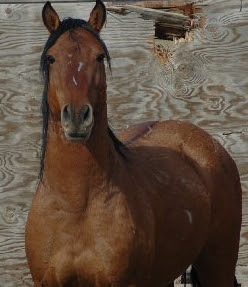 A review of prior Advisory Board minutes has revealed that indeed, what to do with geldings has been of special interest in the past to both BLM and Advisory Board members with subjects ranging from lowering age limits of when to start castrating stallions, how to promote gelding adoptions, and costs associated with long-term holding. It appears the subject of gelding herds first began when the Advisory Board asked BLM to look into “storing” geldings now in long-term holding facilities in vacant livestock grazing allotments because the Board was looking for ways to reduce holding costs. It took BLM two years to get back to the Board with an answer they summed up in one sentence and I’ve summed up even further - not feasible. The BLM provided no explanation as to how or why they came up with this final answer, so it looks like we’re just going to have to take their word for it and trust their conclusions. In the same breath BLM announced this was not an option, they smoothly switched the focus from moving current long-term holding geldings to presenting the Board with an “alternative” of managing wild gelding herds in the HMAs instead. In other words, BLM has determined it isn’t feasible to take geldings out of long-term holding but it may be feasible to return gelded stallions after the round ups back to the range. The Las Vegas Field Office has already proposed doing this twice but so far hasn't followed through and top BLM officials have affirmed the Wild Free-Roaming Horse & Burro Act allows for sterilization and are confident wild gelding herds can withstand any legal challenge. So here’s some food for thought……. What kind of effect will adding geldings have to the already controversial issue of genetically viable herds? If geldings will now be included in the maximum populations allowed, won’t this create the illusion that wild herds are more genetically viable than they really are? 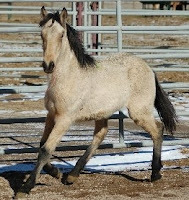 For example, if a herd has an AML of 100 but BLM gelds 20 of the stallions and return them to the range, in actuality only 80 wild horses are now capable of breeding. When someone looks at the AML, unless they know that geldings have been included in that herd, they will think the herds are more genetically viable than they really are. But then again, that’s the best-case scenario. When BLM rounds up wild horses and burros, they usually leave only 40% of what “high” AML is. So after BLM rounds up those same 100 wild horses, they would usually remove about 60 of them and leave 40. What happens if 20 of those are now geldings? Isn’t the breeding population now only 20? And what about horses too old or too young to breed in the 20 now left? And once BLM begins gelding them, will they have to tell the public every time they geld more or only the first time? Will they start with a proposal that gelds 20 stallions but will more be gelded every time they do a round up? Will they be required to tell us “We plan on gelding 5 more? 10 more? 20 more? Or will they just do it based on their own best judgment? Will BLM be able to use gelding herds in conjunction with fertility control drugs on mares? BLM has administered the experimental fertility control drug PZP to many of the wild horse herds over the last few years but has yet to publish much in terms of its effectiveness, impacts or side effects (if any). Should BLM be allowed to start gelding stallions before they are absolutely sure that PZP hasn’t harmed the reproductive capabilities of the herds? Will there be a minimum population established before BLM can even consider adding geldings or fertility control to the herds to keep them viable? Who will decide when and how many foals will be allowed? What rate of population growth are they aiming for? These are just a few of the issues looming on the horizon……..
BLM has already written a draft paper on the subject and presented it to the Advisory Board titled “Options for Managing a Non Breeding Component Within Self-Sustaining Herds of Wild Horses” (July 2006). Click Here to read excerpts from previous Advisory Board meetings regarding gelding management. American Herds will now feature a new section titled “Advisory Board” with links to BLMs website for easy access to the National Wild Horse & Burro Advisory Boards meeting minutes, recommendations, current Board members as well as now providing you the opportunity to post your Board submissions publicly. Check it out! In 1999, the Lincoln County Elk Management Plan was approved within BLMs Ely Nevada District and overlapped 14 wild horse Herd Management Areas and 116 grazing allotments. 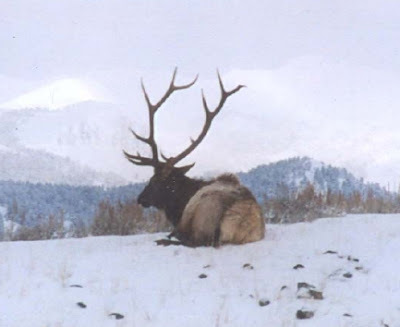 The Elk Management plan cited there was no recorded evidence that elk had occurred within Lincoln county prior to 1979 when big game specialist brought them in. In 2003, 12 of those overlapping Herd Management Areas saw a reduction in wild horse and burro AMLs in one fell swoop as BLM cut the allowable wild horse population from 884 to 644 within all 14 HMAs, a loss of 240 wild horses in an area that spans 2.6 million acres. Meanwhile, the 1999 Elk Management Plan approved an eventual population of 1,850 elk within this same area and would have outnumbered wild horses by almost 3-1. I say would have because in December 2007, the Ely Field Office released their Final Resource Management Plan, still pending approval, which proposes the complete elimination of 16 HMAs in the area with the main reason given as lack of water. If BLMs plan is approved (which it probably will be), 1.6 million more acres of wild horse and burro habitat will be lost and all the wild horses within them will be permanently removed. Here is a map provided in 1999 of the various water sources in the elk management area. Here is a map of the wild horse and burro HMAs that overlap the elk management area. Here is a map of the HMAs overlayed on the water sources. Of the 16 HMAs BLM intends to zero out for all wild horse use, 11 of them are in the same area as the 1999 Elk Management Plan. Wild horses are even hardier than elk so how come the habitat is good enough for elk but not wild horses? How come elk can live there and trash the riparian areas for at least 5 years and nothing is done about it while wild horses were scheduled for removals twice in the same HMAs in the same year "to protect the range". Another of those proposed for permanent elimination is the Highland Peak HMA, which American Herds did a story on back in October titled "Forage Anyone?" In addition to elk within the area, Click Here to read how BLM is managing the livestock in the HMAs too! Over and over again it seems there is room for everything in the "thriving ecological balance" but wild horses and burros. Photo of Clover Mountain wild horse removed in December 2006 and one of the HMAs proposed to be zeroed out. (2) United States Department of the Interior, BLM Ely Field Office, Rattlesnake Allotment-EA #NV-040-07-016. When I first began learning about wild horses and burros, it started with being told that the Las Vegas area didn’t have enough water to support them – that’s why they had to go – for their own protection and the protection of the range. But when I looked a little deeper, I found out that wasn’t exactly true. 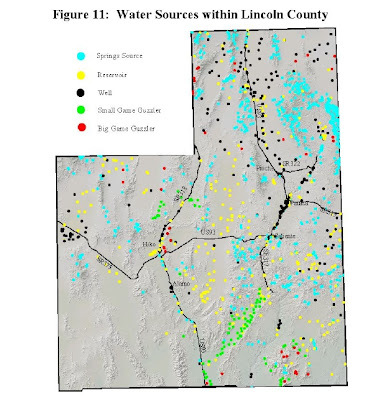 Turned out there were a lot more water sources around than BLM was counting and much of what they were telling the public was convoluted at best. Finding out the truth began with asking a question about hundreds of thousands of acres that disappeared from the Herd Areas and it took a couple of months before BLM finally coughed up the answers. Then U.S. Forest Service made a few changes. The first was to completely exclude wild horses and burros from the top 100,000 acres in the area where the majority of these springs occurred and no wild horse and burro use became the new “policy”. I began noticing an emphasis on the “thriving ecological balance” wild horses and burros were removed to protect was heavily weighted towards the “native” wildlife, often the central focus in decision after decision where wild horses and burros kept getting removed or disappearing altogether. So began the journey of looking around at just what exactly comprised this “thriving ecological balance” they kept getting squeezed out from and that led to checking out State Fish & Game big game statistics on the other “major resources users” within the areas. That led to the realization that hunting was big business and successful “educational programs” conducted by the stewards of hunting, often the scientists that produced the studies that justified their conclusions - Horses and burros bad/native wildlife good - somehow managed to turn wild into feral in the minds of an increasingly environmentally conscious public as they exploited people’s concern about wildlife habitat loss due to mankinds resource exploitation to favor these big game species instead. So now when I hear wild horses and burros must be reduced and removed to protect the “native” species, the first thing on my To Do List is to check just what are the actual populations of those native species, something I might add is often not easily found. When Montana announced that there just wasn’t room for any more wild horses in the “thriving ecological balance” regarding the Pryor Mountain Wild Horse Range, even though Montana is now down to their last herd out of the six that were originally protected in 1971, I decided to go check out what Montana DID have room for. That’s right, up to 160,000 elk and 5,900 Rocky Mountain bighorn. Apparently the habitat is a little more abundant everywhere else in Montana except in the Pryor Mountain Wild Horse Range where the “allowable” maximum number of wild horses in the entire state is 105 - anything more is deemed excessive and begins to endanger the thriving ecological balance. So just within the State of Montana, if you substituted wild horses and burros for elk, you could fit the entire current national “appropriate management level” of every single wild horse and burro throughout the West (27,500), PLUS every wild horse currently being held in long-term containment that was deemed “excessive” (30,000), three times over. So here’s some other fun facts about elk populations and wild horses and burros. Montana Fish & Game estimate that 60% of their Elk Management Units are above population objectives. Colorado recently saw BLM declare the West Douglas Herd in Colorado, which spans 128k acres with an estimated 120 wild horses, as “unfit” for wild horse use. Only 4 herds remain out of 8 with a state “appropriate management level” of 812 wild horses. Meanwhile, Colorado’s 2007 estimated elk population is 250,000 to 260,000 and reports that the elk herds have been 10-15% above population management objectives for over 20 years. The White River-Flat Tops region is home to the largest migratory elk herd on earth – 40,000 elk, which just also happens to be about 12,000 more than the “approved” population throughout the West of both wild horses and burros! The combined estimated elk populations in 2007 for just Colorado, Idaho, Utah, Montana, and Wyoming is 675,000-700,000 elk. The gap of population estimates is almost as large as America’s entire remaining free-roaming wild horse and burro populations. *AML is used to show what BLM believes is “appropriate” since wild horse numbers that exceed AML are removed. Elk Photo from Elk Management in 5 Western States – Montana. All Wild Horse and Burro Statistics taken from BLM Wild Horse & Burro Program website and Fiscal Year 2007 Herd Statistics. For those of you that took the time out to visit Nevada Bighorns Unlimited (NBU) website after you read their article, “Wild Horses on the Sheldon National Antelope Range” you may have noticed all the various groups, organizations and agencies NBU is involved in with - one of which is the Natural Wild Horse & Burro Advisory Board, a typo they have yet to address as it is suppose to read the NATIONAL Wild Horse & Burro Advisory Board. Larry Johnson, past President of NBU and still listed on the Board of Directors, is currently serving (and has for years) as the representative for Wildlife on the National Wild Horse & Burro Advisory Board. Mr Johnson has a passion and interest in wild horse and burro management that has seldom seen an equal, even among long time wild horse and burro advocates themselves and he has been a constant source of guidance and advice when it comes to our wild horses and burros. On April 10th, 2001, Mr. Johnson testified to the 107th Congress, Senate Subcommittee on Environment and Public Works in Reno, Nevada and submitted a Wild Horse and Burro Attachment under the heading Project Funding Needed. His testimony and support were instrumental in helping secure the funding that launched the removal of over 70,000 wild horse and burros from public lands. As a result of Mr. Johnson’s advice, the Nevada Wildlife Commission instituted Item #6 on their agenda during the March 30-31, 2007 meeting and they discussed initiating litigation against BLM to force them to continue wild horse and burro removals, both in Nevada and Nationally. On May 16th, 2007, the Bureau of Land Management conducted their required annual hearing on the use of helicopters and motorized vehicles to remove wild horses and burros from public lands for the state of Nevada. One hundred and thirty public comments were received regarding the issue, 129 to protest and one in support. Larry Johnson was the lone voice in support of using helicopters to continue to remove wild horses and burros from public lands through this method. Larry also works closely with the Arizona Desert Bighorn Sheep Society whose cited goals and Mission Statement includes #5 - Support the reduction of feral burro populations in bighorn sheep habitat. When BLM was questioned about this possible conflict of interest, Acting Assistant Director for Renewable Resources and Planning, Jim Murkin responded, “the claim of ethics violations and conflict of interest of a particular member of the Board for representing the interest for which he was selected is not valid.” No mention was made as to whether these allegations of conflict of interest were investigated. So if anybody happens to be in Tuscon, Arizona for the upcoming National Wild Horse & Burro Advisory Meeting, be sure to stop by and thank Larry and Nevada Bighorns Unlimited for all their hard work in helping America’s wild horses and burros - whether through securing funding for their removals, advocating helicopter captures or now expressing concerns about the costs of holding all our wild horses and burros in government pens, they have been there every step of the way! At least there is a bright note for one wild species on the horizon - bighorn have now expanded to an estimated 50,000 throughout the West. (3) Draft Minutes, Nevada Board of Wildlife Commissioners’ Meeting, Nevada Department of Wildlife, February 9th -10th 2007, page 17. NBU stands for Nevada Bighorns Unlimited and they are a wildlife organization based in Reno Nevada that focuses on the expansion and introductions of bighorn sheep. NBU has recently posted an article titled, “Wild Horses on the Sheldon National Antelope Range” on their home page. In it, they urge sportsmen to unite to block animal rights groups from establishing wild horse and burro herds at Sheldon and urge their members to contact federal officials to protest any continued presence of wild horses and burros at Sheldon. It goes on to say that U.S. Fish & Wildlife Service’s (USFWS) original management policy excluded wild horses and burros but wild horse advocates have continually pressured USFWS to allow free-roaming herds. Nevada Bighorns Unlimited claims in the early 1980’s, USFWS reached a compromise to let some wild horses and burros stay by “converting cattle permits to wild horse and burro use”. Apparently NBU strongly objects to the idea of wild equids being considered wildlife and argues that that they are much more destructive than domestic cattle. They also issue population estimates of 1,800 to 2,000 “in the last few years” with the current estimate of 800 as a result of removals and adoptions. Nevada Bighorns Unlimited finishes up their call to arms by stating that “Horse advocates have demanded the Refuge be opened up for wild horse and burro use”, that the only way this can be defeated is through overwhelming opposition, and to leave “emotions and innuendos to the opposition” (this means wild horse and burro advocates) when they write their representatives to protest. *According to USFWS, wild horses were documented in the area before Sheldon became a wildlife refuge in 1931. Local ranchers managed horses there by mixing domestic horses with the original Spanish horses of the area (who have a documented presence dating back to the 1500’s) because Sheldon was a stocking and Cavalry Re-Mount location during the late 1800’s and early 1900’s. Wild horses didn’t just “happen” in the 1980’s due to pressure by wild horse advocates nor is it about to be “opened up” for wild horse and burro use as NBU tries to imply – wild horses have a longer history and presence at Sheldon than the existence of the Refuge itself. *NBU’s states that USFWS “original management policy excluded wild horses and burros." At the passage of the Free-Roaming Wild Horse and Burro Act in 1971, Sheldon National Wildlife Refuge was co-managed by both BLM and USFWS and neither agency was really clear who had jurisdiction over what until Congress formally made a decision that USFWS would become the sole managing agency in 1977. *In 1977, former managers created the Horse and Burro Management Plan that acknowledged the Sheldon wild horses as historic, that they were a distinct and unique population, referred to them as free-roaming versus the feral non-natives of today’s management crew and accepted that they were now USFWS responsibility to take care of - that is why wild horses and burros are still allowed on Sheldon. USFWS had no formal policy on wild horses and burros in the Refuge System until 1982 - after the approval of management plans for wild equids that still stands today. *These same managers reported that overgrazing by livestock had so completely damaged the area that recovery to the native ecosystems probably could not be accomplished in 40 years. Then they turned around and authorized the most livestock grazing in the history of Sheldon, peaking in 1985 before swinging the other way and eliminating grazing completely. *Nevada Bighorns Unlimited population estimates are a stretch at best. The cited 1,800-2,000 was before the disastrous round up featured on American Wild Horse Preservations Campaigns Section, The Reality of Round Ups. Click Here to read the full story with graphic photos of what really went on! *As NBU stated, the wild horses removed during that June 2006 gather did reduce wild horses through adoptions but in May 2007, when USFWS released their plans to remove more, they estimated 1,200 wild horses and 100 wild burros remained before the new foaling season, which would bring the new estimates to 1,500-1,600. A month later in June 2007, Nevada Bighorns Unlimited financed a “new” aerial census for Sheldon managers that found 700 wild horses missing from the Refuge - only 800 were now remaining. 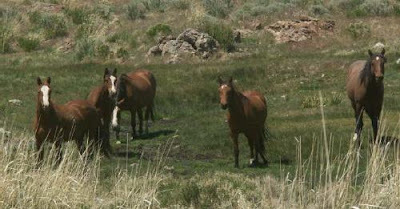 For more about USFWS explanations of where the missing Sheldon wild horses have gone, click Here to read The 700 Club. Sheldon Hart Refuge Project Manager, Paul Steblein and several high-ranking BLM personnel have failed to answer repeated questions about where they believe the Sheldon wild horses have gone. Additionally, when Nevada Bighorns Unlimited President Jim Nelson was asked about NBU’s zero tolerance policy for any number of wild equids at Sheldon, he has so far declined to comment.